Poppy seeds are a popular flavor for Purim - but why?? Nutty and slightly spicy, poppy seeds are one of the traditional foods for the feast of Purim. They are also a beloved flavoring for dishes, both sweet and savory, throughout Central Europe. Yet we rarely think to cook or bake with poppy seeds here in the United States. Why is that? Poppy seeds are good for much more than sprinkling on a bagel, and Purim is the perfect time to experiment with these tiny kidney-shaped seeds. There are many explanations for why Jews eat poppy seeds on Purim — the best-known, of course, being as a filling for hamantaschen, known as mon. 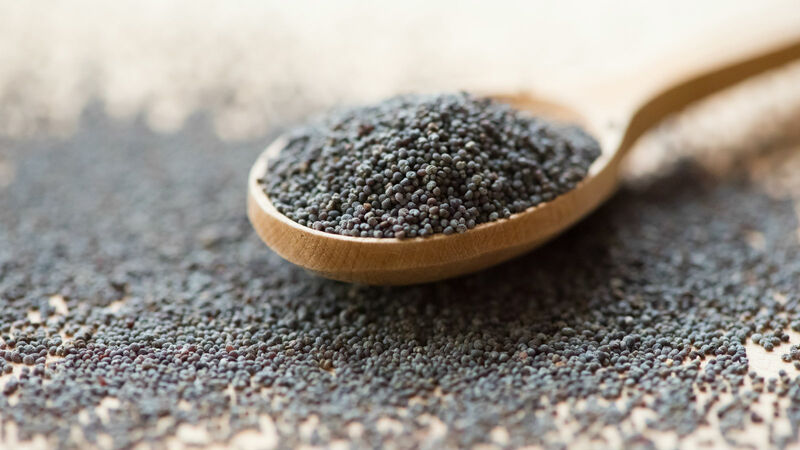 One poetic tale is that Queen Esther subsisted on poppy seeds during a three-day fast while she prayed to God to repeal the evil Haman’s murderous decree against the Jews. Another story is that when Queen Esther was living in the court of the Persian king, hiding her Jewish faith, she subsisted on a vegetarian diet of grains, legumes, nuts and seeds to avoid breaking the kosher laws. Whichever version of the story you prefer, eating foods with poppy seeds at Purim honors Queen Esther’s bravery and her devotion to her people. The Jews of Central Europe certainly had no difficulty incorporating poppy seeds into their Purim celebrations, because poppy seeds were, and still are, one of the most popular flavors in that part of the world. On menus and cafes from Lithuania to Hungary, you will find to this day plenty of sweet and savory dishes made with poppy seeds — from rolls and strudels to noodles and pudding. Sometimes the whole seed is used, for example, to top a roll, but often you will see dishes containing a paste made from the ground seeds. Grinding the seeds, while labor-intensive, releases their oils, resulting in a stronger flavor. So this Purim, let us honor both Queen Esther and our Central European ancestors by thinking beyond the hamantaschen when it comes to poppy seeds. Here, I offer two recipes that showcase the versatility and unique flavor of poppy seeds and would fit right into your Purim festivities. 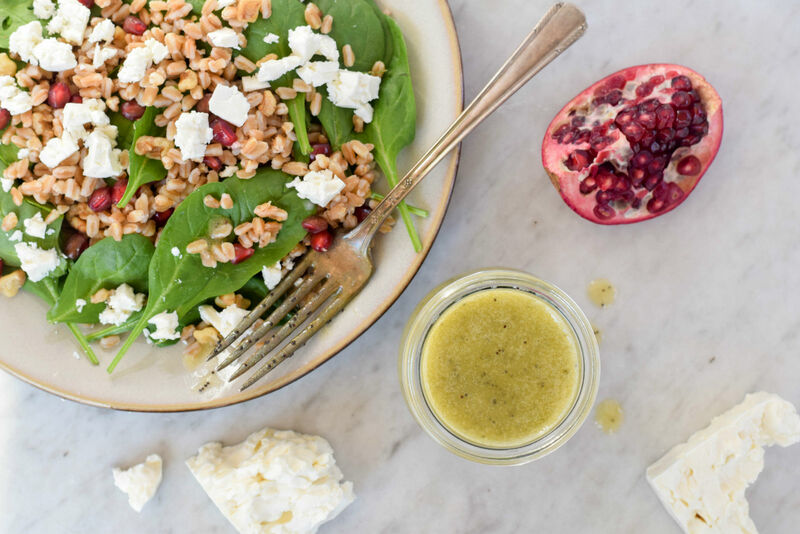 First, a hearty salad of spinach, farro, toasted walnuts, crumbled feta and jewel-like pomegranate seeds in a honey-poppy seed dressing. This satisfying and eye-catching vegetarian main course is a fitting way to honor Queen Esther’s adherence to Jewish dietary laws in trying circumstances. Place the farro in a large saucepan with three cups of water and a generous pinch of salt. Bring to a boil over high heat, then reduce the heat to low, cover and cook until the farro is tender yet still chewy, about 20 minutes. Drain and allow to cool to room temperature. Combine cooled farro with spinach in a large serving bowl. To make the dressing, combine vinegar, poppy seeds, honey and mustard in a small bowl and whisk to dissolve the honey and mustard. While whisking, pour the olive oil into the bowl in a slow, steady stream. 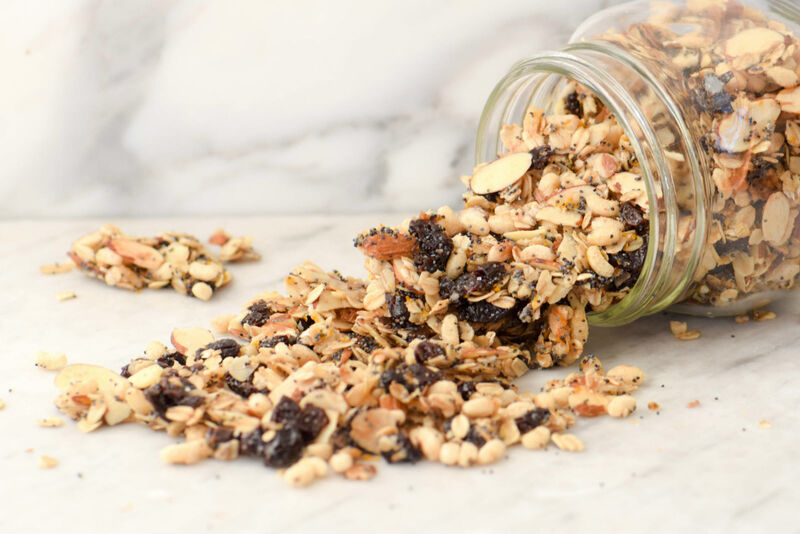 The image of Queen Esther nibbling on nuts and seeds also inspired this sweet, crunchy, nutty granola recipe. Topped with milk or sprinkled on a yogurt parfait, Almond Poppy Seed Granola would make a delightful and healthy Purim breakfast — just what everyone needs after a night of revelry. Preheat oven to 325 F. Line a baking sheet with parchment paper and spray lightly with nonstick cooking spray. In a large bowl, mix the oats, almonds, brown rice cereal. dried cherries, poppy seeds, brown sugar and orange zest. Pour in the oil and honey and toss to coat. Season with salt to taste. Spread the mixture in an even layer on the prepared baking sheet. Bake 20-25 minutes until lightly browned and fragrant, tossing once halfway through. Allow granola to cool completely before packing into jars or bags. Spruce up the classic hamantaschen with some melted chocolate and colorful sprinkles.